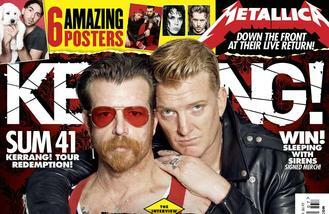 Eagles of Death Metal still cannot comprehend what happened the night their gig was stormed by terrorists. Singer Jesse Hughes, 43, admits it was "chaos" when gunmen barged into their show in Paris last November, resulting in 89 people losing their lives - and he still finds it tough to talk about. He said: "I can't describe it. I saw fear manifest itself like a physical thing, like a blanket, and it was chaos." The group took to the stage in the French capital on Tuesday night (16.02.16) at the Olympia Theatre, the first time since their gig at the Bataclan theatre was attacked by terrorists. The US rock group insist they will not be "silenced" by mindless criminals who intend to kill innocent people and their commitment to last night's concert showed that same sentiment. Josh told the latest issue of Kerrang! magazine: "Whatever the goal was to injure innocent people, it didn't work. It did the opposite. It united people that were un-united previously, and gave a common cause that couldn't be silenced. How could you silence it?" The full interview appears in this week's Kerrang! magazine, on sale now. Gwen Stefani has confessed country star Blake Shelton is only the second boyfriend she's ever had. Audio of Kanye West's alleged meltdown backstage at comedy show Saturday Night Live over the weekend has leaked online, revealing another attack on Taylor Swift. Fans were disappointed when RIhanna bailed on her Grammy performance last minute. Godlike Geniuses Coldplay to bring NME Awards to foot-stomping close. Lemmy's son Paul Inder has praised the Hollywood Vampires' Grammys tribute to the late Motorhead rocker. Pop star Joe Jonas has reportedly struck up a new romance with model Juliana Herz. Anti-Beyonce campaigners outnumbered by fans at protest. 50 Cent blasts bankruptcy payment 'slave' plan. Reese Witherspoon and Ruby Rose have praised Taylor Swift for her empowering acceptance speech at the Grammy Awards on social media.